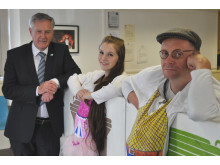 The Elgin-based Out of the Darkness Theatre Company joined forces with Moray Council’s waste management section to stage a short play on recycling and how to make proper use of different coloured wheelie bins. 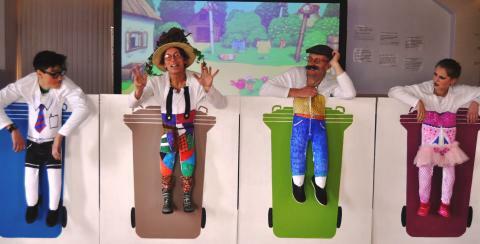 The show – featuring four actors from the theatre company and life-sized cut-out wheelie bins – toured all of the area’s primary schools in the run-up to the autumn break. It was devised as part of the council’s ongoing campaign to educate the younger generation about the benefits of reducing waste and increasing recycling rates ever further. Moray Council is already one of the leading Scottish local authorities in terms of recycling and hopes the joint initiative with Out of the Darkness will help instil the merits of recycling in the minds of residents from a young age. Councillor John Cowe, who chairs Moray Council’s economic development and infrastructure services committee, said: “I saw one of the performances for myself at a primary school in Elgin and I thought it was extremely good. “It was presented in a way that the children understood and could relate to and certainly got across the message about the importance of recycling to the environment. Lee Cruickshank, who was involved in scripting the play for Out of the Darkness, said it had gone down well with the young audiences across Moray.